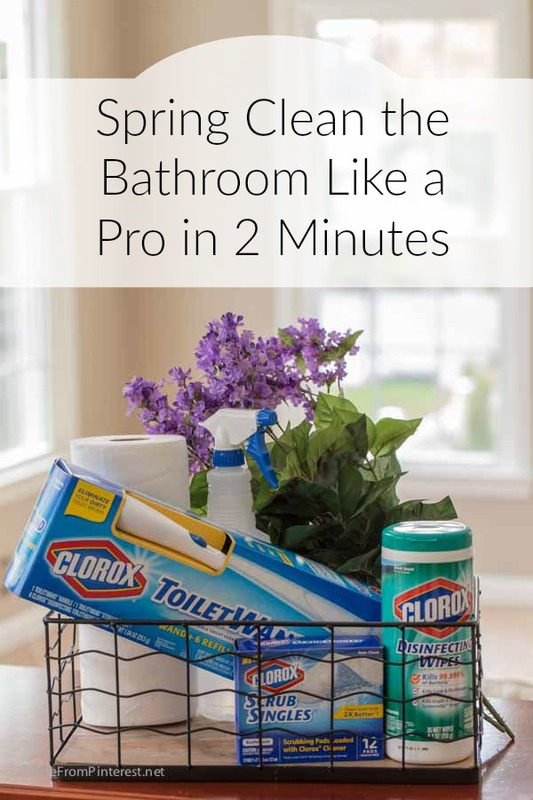 With a few simple supplies you will be able to have a spring clean bathroom in 2 minutes! A few pro tips and some key supplies picked up at Walmart can have your bathroom company ready in a flash. Don’t think you can do it? You really can if you have a plan and work smart. A big thank you to Clorox for sponsoring this post! Dear Readers, I would like to reintroduce you to my imaginary friend Candy Dish. 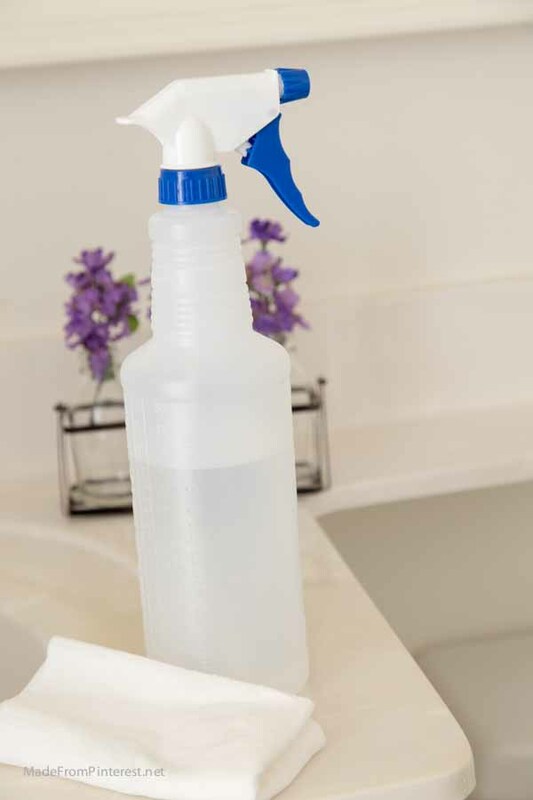 For those who have been following us since, well, forever, you may remember her from one of my most popular posts Easy Shower Mold Solution which I wrote back in 2013. Clorox was Candy’s friend then, and Clorox is Candy’s friend now. Candy Dish has been my friend since I was quite little and she has always been an important part of handling embarrassing situations for me. Like, say, when the entire box of cereal spilled out all over the floor. That was Candy. She can be clumsy like that. I should have thought to use her when I wrecked my parent’s car. But I don’t think she would have taken that one on. The bounds of friendship only go so far. Candy Dish is willing today to extend her friendship by sharing a recent embarrassing social situation. She is not the best of housekeepers, as you can see from the black mess in her shower in the aforementioned post. Of all household chores, cleaning the bathroom is her least favorite. It follows then, that spring cleaning the bathroom is not high on her list of priorities. Reducing that task to 2 minutes was of great interest to her. Some girls can tolerate a little mess, but don’t really want others to know it. 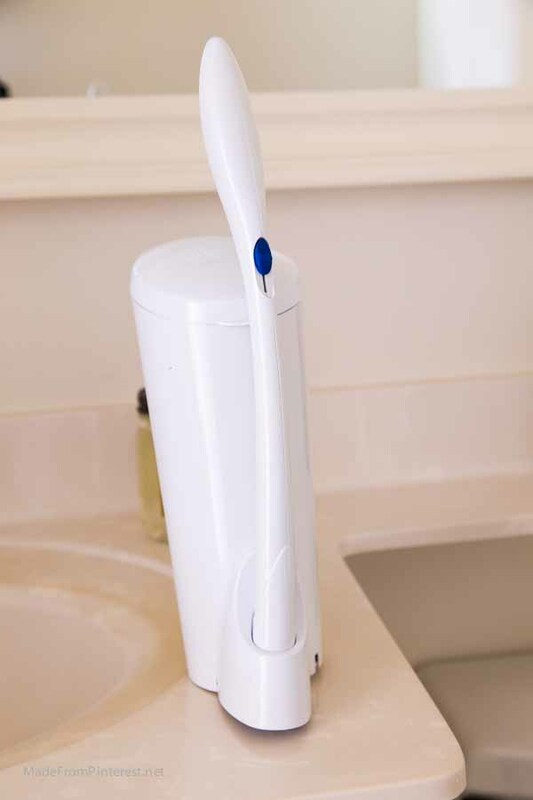 Say, a spot of toothpaste on the sink gets left behind, and dries into a hardened dot that she begins to think is part of the design of the countertop. Or shall we say tastefully, a bit of mess in the toilet that doesn’t quite whoosh away as easily as one would like when flushing. And it remains there for way too long. These things do not cause Candy a great amount of alarm. She does not particularly like her bathroom to be left permanently in that condition, but it does not bother her enough to do something about it immediately. But when she received the call she panicked. Normally, Candy enjoys calls from her husband, but this one made her heart race in a way she did not like. He was calling to let her know he was on his way home. This part of the equation made her happy. But the fact that he had run into an old friend and invited him and his family over spur of the moment is what had her running around the house practicing the art of tidying in a very hurried way. This is how I know that it can be done it 2 minutes. If she had skipped her shower, were wearing her grubby clothes and had set aside the day for cleaning, it would take much longer. 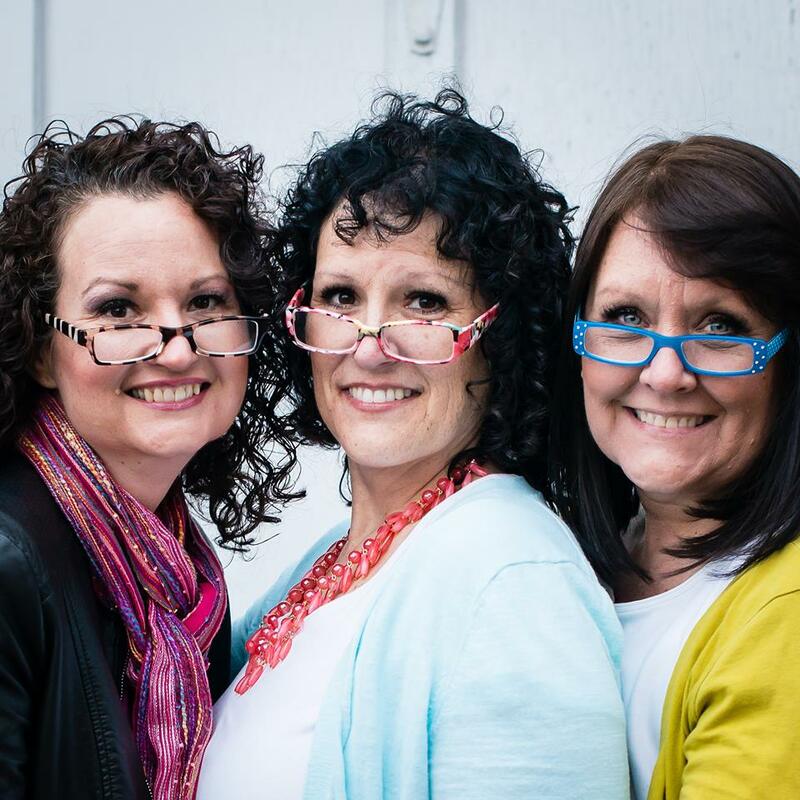 But as we all know, one is amazed at how much cleaning they can get done when pressed against the threat of someone seeing how we really live. And it is not the way we would like to present ourselves, however accurate it may be. Candy Dish, like myself, does not always want to be perfectly honest about her level of comfort with a bit mess. She told me how grateful she was that I had helped her put together this little kit of last minute solutions to common messy bathroom problems. It was with these tools she was able to spring clean her way to a company worthy bathroom all in a matter of two minutes. The trick is in the organization and tools. For organization, move from top to bottom, left to right. Begin at the to the left of the toilet so the toilet will be the last thing you clean. Remove cobwebs and dust above the doorframe. 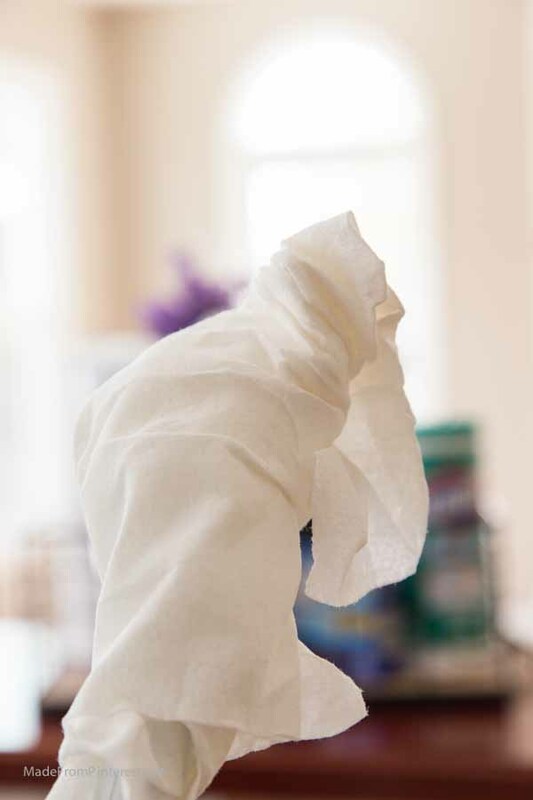 Remove fingerprints and wipe handles with Clorox Wipes. 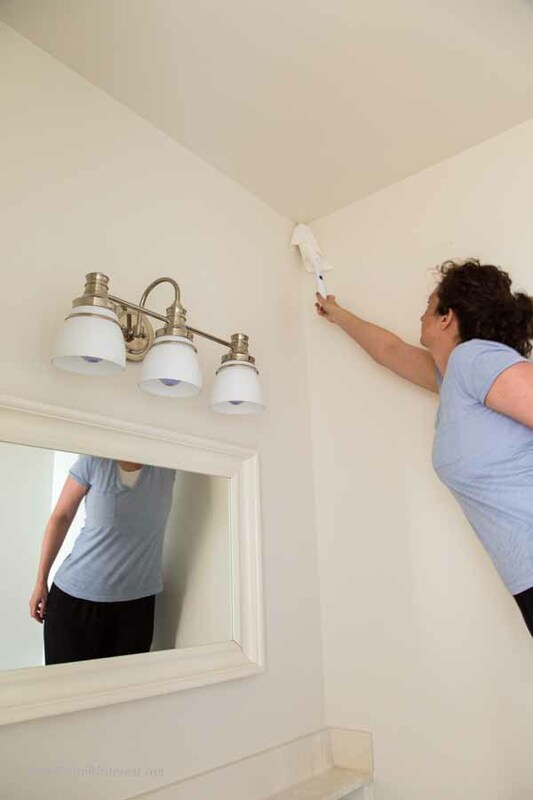 Tough spots can be handled with Clorox scrub singles. Move to the next wall. Wipe light switches, clean sink, clean mirror, dust frames, wipe faucet, clean the cabinet doors, clean the outside of the toilet and then the inside. A quick sweep or vacuum of the floor and then empty the trash. 2 minutes, done! Using disposable products is a real timesaver. Tool number one is the Clorox Toilet Wand which I found in the mop and broom aisle at Walmart. The wand is stored in the caddy. Inside the caddy are disposable pads preloaded with Clorox toilet bowl cleaner that attach to the end of the wand. When your done, release the pad into the trash with a push of the blue button. Ms. Dish loved not having to touch a single thing and especially liked not having a grody brush hanging about. She was also thrilled to find this had the strength to get that unmentionable spot out. The wand even acted as a great duster by wrapping some paper towels around the end and getting into any dusty corners. Candy couldn’t grasp my meaning, so I had to show her how. 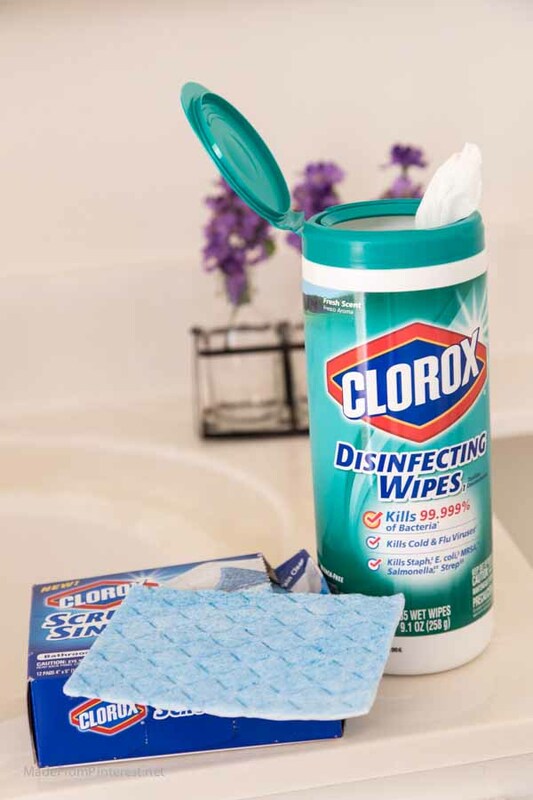 Clorox wipes are a favorite of Ms. D’s. Admittedly, she overuses them when wiping toilet seats as she wont to be sure her hand does not touch anything remotely icky. In part, Candy Dish hates cleaning the bathroom because she hates touching what she considers gross. She had always wondered how her bathroom was to be thoroughly clean when using an old sponge to clean with. Certainly, she reasoned, the sponge needed cleaning as much as the bathroom did. So she made quick use of Clorox scrub singles. A quick spritz of 1/2 water and 1/2 vinegar did the trick for cleaning mirrors and pictures. But that was not the only trick she had up her sleeve for amazing results. Candy Dish loves Viva paper towels! She used to save them for the guest bathroom only because they felt like luxury paper. 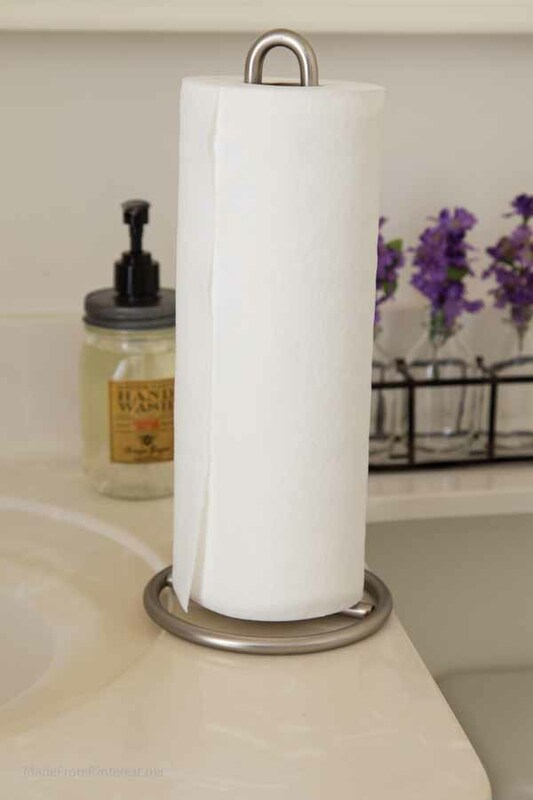 She much prefers using paper towels to a hand towel in the powder room for guests, because as we know, she does not like contact with icky things, and towels used by multiple people most definitely live in the realm of icky. She found since making this substitution that the flu and cold viruses were greatly reduced in her household. But upon using them for cleaning, she found they were much superior to their counterparts in that area as well. Less streaks, less lint and much more absorbent. But these are mostly rationalizations, for the real truth is she just plain prefers the feel of Viva paper towels and that alone makes unpleasant chores more bearable. Walmart is wonderful for quick touches to spruce up for spring. Ms. Dish appreciated that little extra touch from the floral department. 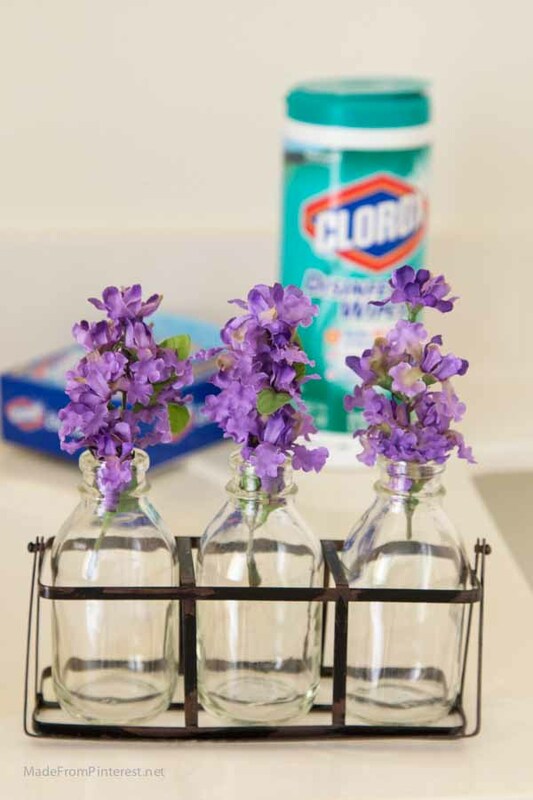 Adding some silk flowers to vases that sat empty, waiting for use, added that bit of spring that does not need refreshing, which suits Candy well, since when it comes to the bathroom she prefers spend as little time cleaning as possible. She and I hope you will enjoy your spring clean bathroom! This is a sponsored conversation written by me on behalf of Clorox. The opinions and text are all mine.